Editor’s Note: This letter is taken from Letters of Arthur J. Braginton, published in 1908. Arthur was the son of Margaret Burke, born in New York in 1852 to Patrick Burke and Mary Collins, both from Annaghdown. He undertook a bicycle tour of Europe during 1899, including a visit to Galway, and returned to the US in 1900. He married that year and died months later in May 1901, of typhoid fever. We are grateful to Julie (Braginton) Graf for sharing this with us. Arthur was her great-great-granduncle. Londonderry, Ireland, May 30, 1900. Last summer it was my happy experience to find the home of one of my grandfathers over in the heart of Merry England. I mentioned the circumstances at the time and by way of apology for further personal and family narrative will only say that justice and equity ought to be shown both sides of the house. In England I had no directions or information whatever, while in Ireland I had a letter brought with me from home, written by Patrick Collins to Mary Collins, my mother’s mother, thirty-one years ago. The letter heading read Creggduff, Parish of Annahdown, County Galway, Ireland. The village lying seven miles to the northeast of Galway, was easily located on my map. Having reached the latter city on my way from Dublin, I continued on through the bare granite hills and over boggy stretches to the village of Creggduff. I stopped on the outskirts of the town to make inquiry and gain what information I could regarding the family of Patrick Collins. The light auburn-haired woman whom I first encountered absolutely refused to give me any information in any form; she did not like my appearance evidently and certainly did not understand my mission. She stood off a ways from me, eyed me up and down, from head to foot and asked in an alarming tone of voice: “What is your business in this village, sor?” “Oh,” I replied, “I just rode over to see some relatives and friends. My grandmother, Mary Collins, was born over in yonder somewhere and I came to see the old home.” With the mention of my grandmother’s name, the whole demeanor of the woman changed. She invited me into the house, showed me every courtesy, and at once began to tell me of the family and all of its connections. She finished by making her husband, who was working in the fields, second cousin to me, descending through my grandfather’s, Pat Burke’s, side. Later, she sent a boy with me to the home of my mother’s uncle, William Burke. I stayed several days in the village, visiting the homes of Edmund Collins, John Kelley, Mrs. Michael Fahey and William Burke. I went to the old Cavanah homestead, where Mary Cavanah, my great-grandmother, was born and lived all her years. Here, too, lived John, who afterwards became well known as the Father John Cavanah of Knock. Half a mile further on was the home of the Robinsons, in the line of cousins, two of whom became priests in the parish of Annadown. The houses where my grandfather and grandmother were born still remain in their pristine condition. There is very little about them that is affected by season or weather. The roofs must be re-thatched once in a generation and the walls, both inside and out, whitewashed every dozen years. With this little attention the Irish cottage is preserved for centuries. My friends here, though they had never heard of me or my name, received me with the greatest pleasure and instructed me in all the history of the family as well as present local customs of the Irish people. Back from the cities, in these country districts, the people know nothing but simple hospitality and are not at all affected by superficial courtesy. The neighbors and friends are welcomed to the fireplace to spend the rainy day or to talk away the long evenings. I shall remember the evening at Uncle William Burke’s where six old men gathered in for a social hour. They were all old friends and neighbors. Each came a different way alone and as he entered the house he announced his presence with the words: “God bless you,” and my uncle or some of his household returned: “You are indeed welcome, sir,” and prepared him a place by the fireside. Their conversation was carried on largely in the Gaelic tongue, broken occasionally by questions and remarks to me in English. Thus the old men sat and talked through the long twilight of the evening. 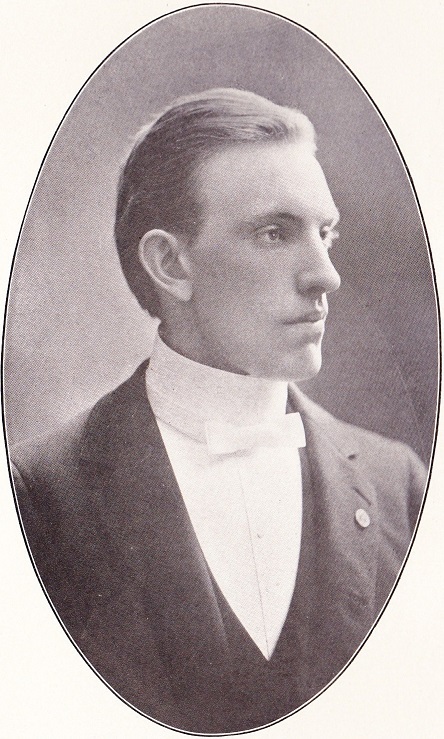 Arthur J. Braginton (1875-1901), taken in 1900. Our thanks to Julie Graf for this photo. From Creggduff I rode on toward Londonderry; near Ballyhaunus I had the good pleasure to find the relatives and friends of Mr. John Dalton of the Manson “Democrat.” Equipped with their addresses I rode without the least discouragement to the home of the Daltons. I am quite certain that Editor John will not be offended by the remark that he has come from a worthy family; members on each side have at times held high places in ecclesiastical affairs, while others have figured in the political strife for freedom in Ireland. I was cordially received by our good friend’s Aunt Margaret, who deeply regretted that she did not have “a mite of special” for me, but I told her not to grieve over it for the Irish national custom of a “spirit” reception was wholly unknown in America. One of the most interesting things I saw in Ireland was a “pig fair,” held in the village of Dunmore. These fairs or markets occur once every month. Farmers from the whole country about on these days bring in their fatted swine in little bunches, each hog being marked or labeled in some distinguishable manner by the owner. A daub of red paint on the hog’s back, some times on one of his ears, the bristles shaved off in the form of a cross or a colored cord tied around the animal’s legs, are some of the methods adopted. The hogs are nearly all bought by jobbers from London and Liverpool, who “lump” them off, offering so many pounds of English money for a bunch. Scales are not much used though the old time balance is at hand should the occasion demand. It is a huge affair. From the strong beam hangs the platforms, on one of which are placed the hogs in a crate and on the other, weights sufficient to lift them. As Dunmore lay several miles from the railways at Faum [Tuam – ed.] and Ballyhaunus, the swine had to be driven to these stations for shipment. For nearly six miles on either side of Dunmore I had to contend with a long file of white hogs which would scarcely allow me to pass. In the rear of every considerable group followed a number of carts in which the exhausted and fatigued, the lame and blind, were priveleged to ride. On one other occasion, in Tryol, I was greatly delayed by a line of cattle extending over a distance of twenty miles. There cattle must be led. The law prohibits driving them. The hogs at Dunmore bring a price nearly double that given in our country. After the hogs are sold, the farmers gather in groups and the can of porter goes round and when it is empty it is filled again. Excitement sometimes prevails. Market day is always a great day among the people and nearly everyone goes to town whether he has anything to sell or not, to enjoy the lively scenes and perhaps become refreshed at the expense of his neighbor. From Ballyhaunus I rode on to Londonderry without any particular incident, One evening I rode until ten o’clock and even then it was not dark. Londonderry lies on the 55th parallel of latitude, which is 12 1/2 degrees or about 850 miles further north than Manson, so that twilight here is not cut off as quickly. The sun sets about eight o’clock now. In Scotland three weeks ago cyclists were not required to light the lamps until after 9:22. My idea of Ireland is quite different from what it was before I had a chance to ride around through the country and see conditions as they are. Most of the people are poor, but the general status is much better than it was a few years ago. Drinking seems to be almost a universal custom. Ale, stout, and especially porter, are consumed in large quantities. Catholic temperance societies are being organized in some parts and are exerting a splendid influence. The school system is defective and the best of harmony does not exist between the state and church schools. I was able to secure quite a number of typical photographs of the Irish people, which I highly prize. The “pig fair,” an “Irish tea party,” with the Reverend Friar, the old gentleman and lady seated beneath the luxuriant foliage of the trees, the “Irish Cottage,” where the lean pig eats at the door, the stylish “Irish side-car,” and especially the “Irish Colleen,” the beauty of Ireland seated at her spinning wheel, her blue eyes and dark hair shaded by a fancy broad rimmed bonnet, are perhaps most natural and inviting. Ireland has had a varied and interesting history. In the days of St. Patrick, the Druids built strange round towers, which are now the landmarks of an earlier civilization; everywhere these ruins are to be found. The Irish character has ever been manifest in the tenets of the fathers. The early days of English oppression, when priests went about with a price set upon their heads, are still remembered. Though religious liberty has been gained, they still clamor for political freedom – home rule for Ireland. Friday morning, June 1st – I expect to take the steamer “Parisian” of the Allan line for Montreal. The first land after the fair “Emerald Isle” sinks below the ocean will be Cape Race on the south coast of Newfoundland. To Ireland and to Europe – Farewell. The first half of this letter first appeared in our Summer 2018 Newsletter.